The elderly are often seen as a burden but today's seniors are healthier and will stay in the workforce longer. This calls for fresh policies for the future. Let's be honest: Many of us view ageing in a negative light. Ageing means deterioration, helplessness and the fear of being a burden. But ageing is a natural human process that starts from the day we are born. Instead of seeing ageing as a malady, we need to fundamentally change our perception of ageing to focus on positive policy solutions. Back in the hunter-gatherer age, the value of a human person was determined by his or herability to gather food, an early form of employment. Hence, women, the elderly and the young were considered less desirable, and even disposable, during hardships as their physical strength did not allow them to be as productive as men. So it is not too shocking to hear tales about Japan's ubasute - an ancient ritual where the elderly are abandoned on a mountain to die. On the other hand, the Confucian tradition of respecting the old by showing filial piety has also dominated the cultural thinking and moral code of Asia for centuries. The combination of both created a puzzle where we are taught to respect the elderly but patronise them as subpar humans and assume that the only policies affecting them are in healthcare financing and caregiving, which portray them in a helpless light. But with increased longevity and progress in human civilisation, the traditional perception of the elderly as weaklings is being increasingly challenged by modern reality. Asia now prides itself on having the greatest longevity in the world. 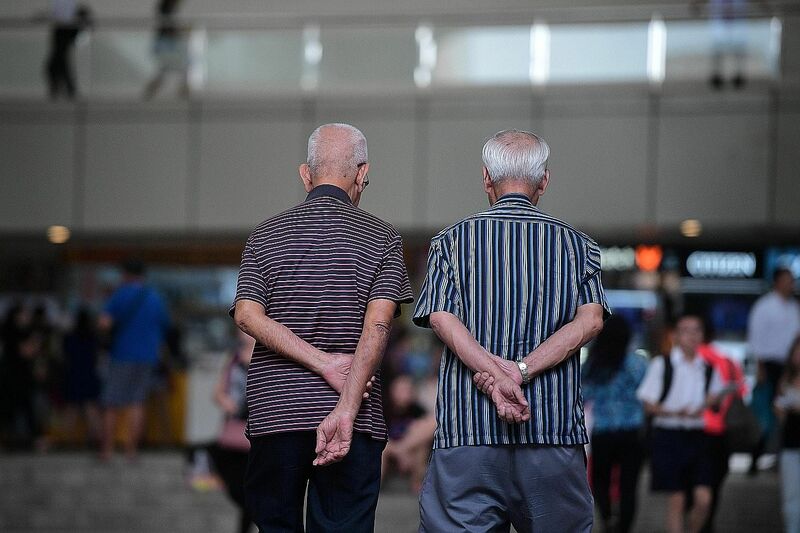 Findings by the ongoing Singapore Life Panel, the world's largest high-frequency longitudinal study on the ageing population, by the Centre for Research on the Economics of Ageing (Crea) at the Singapore Management University, shed new light on the issue. Half of men and a third of women are still working full time at age 62, and another quarter are in part-time or flexible work or self-employment, found the study, which was started in September 2015 and which surveys an average of 12,250 Singaporeans and permanent residents aged 50 to 70 every month. It aims to determine how prepared Singaporeans are in coping with the financial demands and risks associated with ageing. In short, more than 60 per cent of 62-year-olds are still self-reliant and actively contributing to society. Even at this age, 40 per cent of Singaporeans are still free of any chronic health condition, and 94 per cent are free of any difficulty with activities of daily living. Three-quarters have at least a secondary education - one third have more. Mature workers remain highly dynamic, with one in three workers aged 50 to 70 having started their jobs in the last five years. Instead of embracing this human development victory, governments around the world are still mainly concerned about the impact of ageing on healthcare finance, affordability of pensions and the tax burden for younger generations. Crea has found that incoming generations expect to continue working later in life. Among those in their late 50s, 40 per cent of men and 30 per cent of women expect that they will still be working at age 65 ("S'poreans expect to work till at least age 65"; The Straits Times, Oct 28). Compared with the western hemisphere, where countries face a shortage of elderly labour supply, this finding is promising. Of course, employers' perspectives need to be investigated. But if managed well, countries with an ageing population such as Singapore could compensate for labour shortages by utilising their wise, productive elderly workforce. It is essential to understand that just like all age groups, the elderly are economic agents as well as consumers. It does not matter whether you are 20, 50 or 90; we all consume and contribute to society in one way or another regardless of age. We may consume different bundles of goods - my 94-year-old grandmother buys a lot of gifts for her grandchildren, while I prefer to spend on travel. But core consumption baskets such as utilities, healthcare, housing and food remain mostly the same throughout life. Clearly, then, ageing policies demand constructive planning that includes short-term or long-term planning and all aspects of policymaking. Because the Government has one Budget, opportunity costs need to be included when resource allocation is considered. For example, when caregiving costs are calculated, for family caregivers, the total cost is the sum of caregiving cost per hour times the hours plus the opportunity cost - that is, the income forgone given that family members have a higher chance of exiting the labour force to perform caregiving duties. In addition, demographic changes produce an impact on both short-term and long-term policies. For example, an increase in the elderly with mobility issues could mean overcrowded nursing homes. In the long run, this will require a careful calculation and mapping of long-term healthcare financing and the need to examine the potential pressure on the fiscal health of a country. In short, an exaggerated emphasis on ageing as a singular issue - health, for example - risks misallocating resources while defining mature workers as a purely dependent population. In addition to labour and health issues, household wealth (including housing wealth) provides a more complete picture of financial adequacy for the elderly. Yet, there is little debate about how these all interact to comprise the whole picture of a household's preparation for retirement, to understand how resources will pan out over the coming decades. Since ageing-related policies have an impact on the long term, they require meticulous planning in the short term and adjustment in the medium term. Hence, constant surveying of 50-to 70-year-olds today is crucial in preparing policymakers for what is yet to come. This is not a simple task, as the incoming batch of the elderly has more complex profiles, is better educated, wealthier and more used to having choices. The seniors are also more likely to refuse to be viewed in a passive light and want to contribute actively to society as long as they are able. How baby boomers age and how they can participate in economic activities will determine how sustainable economic growth will move forward for decades to come. No one questions the serious consequences of ageing, but to work out viable policy responses, we need to first view the elderly as economic agents just like everyone else in society. The incoming elderly are not weak links we need to baby, but they are a version of ourselves in the coming decades. A fundamental change in thinking is in order, or we risk serious economic decline. • The writer is associate director at the Centre for Research on the Economics of Ageing, Singapore Management University.